The 144-page Kobold Guide to Board Game Design gives you an insider's view on how to make a game that people will want to play again and again. 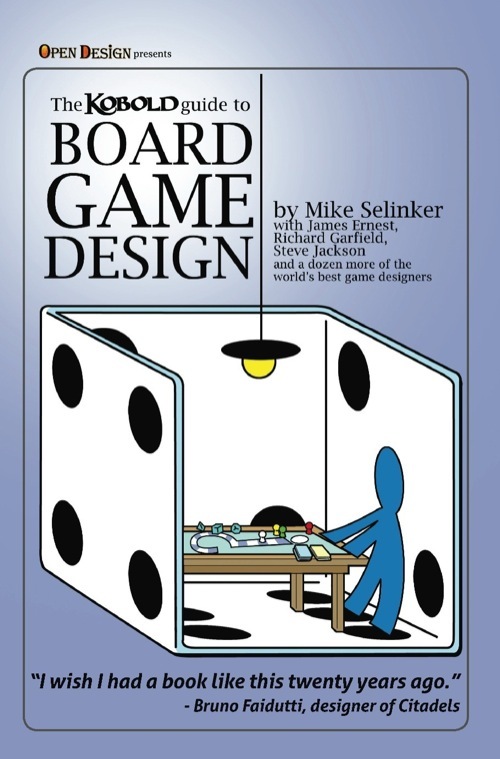 Author Mike Selinker (Betrayal at House on the Hill) has invited some of the world's most talented and experienced game designers to share their secrets on game conception, design, development, and presentation. In these pages, you'll learn about storyboarding, balancing, prototyping, and playtesting from the best in the business. Whether you're a game enthusiast who wants a deeper understanding of the hobby, an aspiring designer looking to break into the industry, or a seasoned pro who knows there's always more to learn, there's something for you in the Kobold Guide to Board Game Design. Winner of the Origins 2012 award for Best Game-Related Publication!